Combine above ingredients in a large mixing bowl and allow to stand for about 3 minutes until the cereal softens. Add to cereal mixture and mix together well. Combine the dry ingredients and add to the wet ingredients; stir only until combined. Gently fold blueberries into the batter. 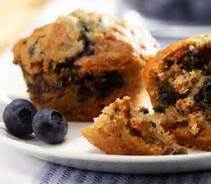 Divide batter evenly into 12 muffin cups that have been sprayed with nonstick cooking spray. Bake at 400 degrees approximately 20 minutes or until golden brown. *May use more Splenda granular instead of sugar if necessary.